Big or small, getting together can generate waste. But gatherings are also celebrations of our community. So it makes sense that we pause to ensure they demonstrate our shared values for each other and the planet. Master Recyclers help events get their green on. Welcome to Tony Hair New Outreach Coordinator in Washington County! Tony is your new contact for Master Recycler activities in Washington County! Although he looks too impossibly young to have spent two decades working in waste minimization and management, Tony has dedicated nearly half his life trying re-think waste. Tony devoted eight years to Waste Management, the nation’s largest waste and recycling hauler. He served three and a half years at Portland State University (PSU) in the college’s Campus Sustainability Office and another three at Community Environmental Services, a student service and research unit. While at PSU, Tony earned degrees in Environmental Studies, Geography and a Geographic Information Systems graduate certificate. He’s excited to apply his experience and endless enthusiasm assisting residents of Washington County in transforming their waste into resources. Master Recyclers are going to have a lot of fun working with him this spring and summer! If you need help, a kit or resources on your project, please think of Tony as a great starting place. He will also be organizing Master Recycler gatherings and tabling opportunities. Master Recycler of Color Gathering Coming Up! Leesha and I (Janine) would like you to join us in a gathering of networking, socializing, and developing projects and connections in our community. More than anything, we would like to get to know you and learn about your projects. I cannot wait to meet you." WHAT: 8-week course and 30-hour volunteer program. WHEN: Eight consecutive Wednesdays at 6:30 - 9:30 p.m., Starting September 6, and two Saturdays from 8 am to 2 pm on September 16 and October 14. WHERE: Beaverton Community Center, 12350 SW 5th Street. COST: $50. Partial and full scholarships are available without an extra application process. Thank you to the Master Recyclers who completed their 30-hour volunteer commitment this month. Class 64 just ended on March 8th and they already have four certified members! Elle likes to take fun pictures as well. This one was way back during the class tour of the Blue Heron paper mill which is now closed. Elle McKay (Class 41) became a Certified Master Recycler during Earth Week at the PCC Cascade Eco Fair. Elle said it was fun with new Portland Climate Action Now save your food kit. Earlier, Elle had staffed booths on recycling and compost and also helped at collection events and the giant swap event Trash to Treasure. 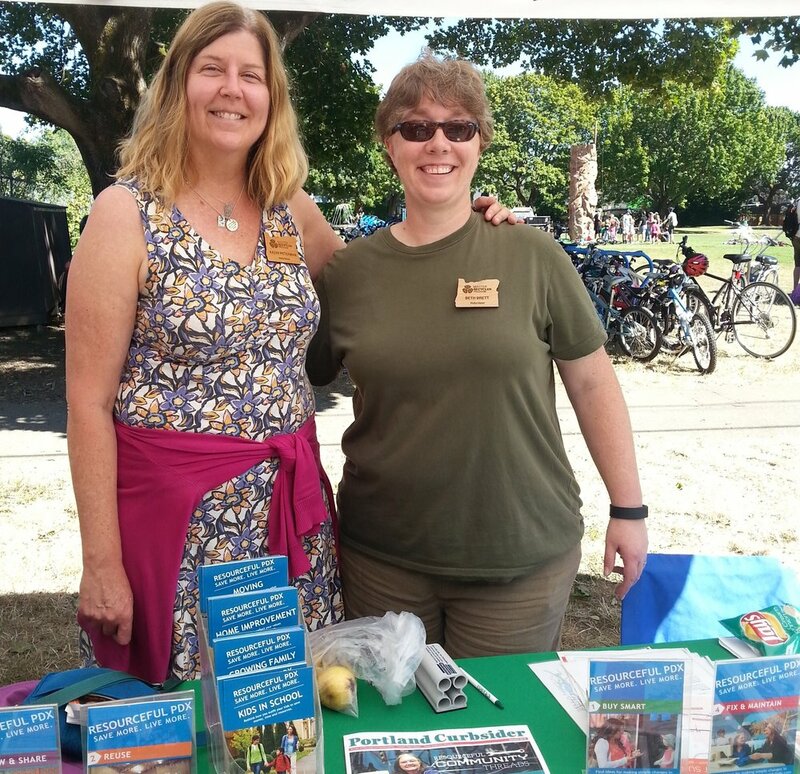 Beth with Kathy (Class 62) enjoying a Summer day at Sunday Parkways. Beth Brett (Class 61) engaged East Portland residents at several events on reuse, fixing stuff, borrowing and sharing. She also joined a team of Master Recyclers to offer information on recycling at the Zoo during Twilight Tuesday (Not a bad gig). And to round things off, she offered refresher recycling presentations at work and Y-Arts Development Center. Vicki is center with classmates Jill Natowitz and Nancy Klitch. Vicki Ingber (Class 61) became a Certified Master Recycler on Earth Week. Vicki organized Earth Day festivities two years in a row for the World Trade Center downtown Portland. She and fellow Master Recyclers engaged tenants of the large office building on food waste prevention, waste prevention and recycling. Brion Hurley (Class 64) is a volunteer for Lean Portland, who provides community consulting to non-profits. Using a collaborative approach, Lean volunteers help organizations improve, become more efficient and meet their missions. Through the Master Recycler Class, Brion hooked the Lean Portland team up with Free Geek, Scrap and the Rebuilding Center. Members for those organizations walked through their buildings and just worked through problem areas - and the results so far have been fabulous! Alaina Labak (Class 64) is a grocery clerk at New Seasons Market. She participated in her green team in her own store as well as provided leadership and presentations during the All-Store New Seasons gathering. She even made a fun video with recycling "tips and hacks" for fellow employees. Nancy Mattias (Class 64) has been active at her neighborhood school Rigler Elementary in organizing a community Earth Day event. She also offered a presentation on food waste prevention at her church. Her big project, which she is just getting started, is to start a composting program at Rigler Elementary!! Sherry Turk (Class 64) jumped right in by helping promote the Rebuilding Center at trade shows. And then supported recycling efforts at Race for the Roses and Bridge to Brew. Volunteer. Join in. Make a Difference!